The first generation (1996–2000) debuted in November 1996. It was based on the P80 platform and was available with front and all-wheel drive (AWD), the latter marketed as the V70 AWD. In September 1997 a crossover version called the V70 XC or V70 Cross Country was introduced. The sedan model was called Volvo S70. The second generation (2000–2007) debuted in spring 2000. It was based on the P2 platform and, as with its predecessor, was also offered as an all-wheel drive variant marketed as the V70 AWD and as a crossover version initially called V70 XC. For model year 2003 the crossover was renamed to XC70. The sedan model was called Volvo S60. The third generation (2007–2016) debuted in February 2007. It was based on the P3 platform and marketed as the V70 and the XC70. Production of the V70 ended on 25 April 2016, the XC70 continued until 13 May 2016. The sedan model was called Volvo S80. The first generation V70 was an improved development on the basis of the Volvo 850 estate. Its overall design became more rounded doing away with the 850's square edges. Among the many changes were a completely revised front end, fully painted bumpers and side trim and clear indicator lenses all around. Most of the interior was redesigned, with new seats, door panels and dashboard. According to Volvo a total of 1800 changes were made. Standard equipment was improved significantly with remote central locking, heated and electrically adjustable mirrors, two front- and two side airbags, power brakes with ABS and power windows being standard on every car. Trim levels varied for each market as did equipment levels of the most basic trims. In the United States, the badging denoted the engine variant, and to some extent the equipment level, whereas in Europe engines and options could be chosen individually. In all markets more powerful versions received better or upgraded standard equipment. The T5 and R were the series high-performance models. Small cosmetic and major technical changes were introduced for model year 1999. The Volvo logo on the front grill was redesigned, the square XC-style roof rails replaced the rounded version and black edge stickers on the rear doors were removed. Volvo improved the SRS-system airbags by introducing dual stage deployment logic for the front airbags, and its second generation, side impact protection system side airbag (SIPS-BAG II), whose volume was increased to offer better protection. A whiplash protection system (WHIPS) was also introduced as part of the standard equipment. New engine management systems with drive-by-wire throttle replaced the mechanical throttle on all petrol turbo models, the turbo diesel engine retained a cable actuated throttle. The anti-lock braking system (ABS) was upgraded from a three-channel to a four-channel system, and an upgraded traction control now called STC (Stability Traction Control) was introduced. All-wheel drive models received thicker rear brake discs and redesigned rear calipers. The 4-speed automatic transmissions were upgraded to adaptive shift logic, replacing the previous three-mode selection. For model year 2000 a new 5-speed automatic transmission with adaptive shift logic was introduced. It was only available on non-turbo, front-wheel drive models and the 2000 V70 R AWD. The naturally aspirated 10V engine was replaced by a detuned 20V variant. Drive-by-wire throttle was introduced for all non-turbo petrol engines. The 2.0L V70 XC was discontinued. The standard V70 was available with a variety of engines, gearboxes and equipment. The standard configuration was front-wheel drive. An all-wheel drive version badged as V70 AWD was available. For some markets Volvo offered a diesel version badged as V70 TDI. In countries such as Italy, with high taxes on cars with more than a 2.0L engine capacity, special petrol models with a 2000 cc engine capacity were offered. This included a 2.0T and a 2.0L T5 version, the latter with a slightly lower power output than the 2.3L variant. An optional third row seat increased occupant capacity from five to seven seats while reducing underfloor storage space in the trunk. With the V70 Bi-Fuel Volvo continued to offer a factory compressed natural gas (CNG) powered car. A 95-litre (25 US gal) tank installed in the trunk allowed for a claimed range of 250 km (155 mi) running on CNG only. Due to the bulky tank, rear cargo space was reduced considerably. Drivers could choose whether their car ran on petrol or CNG at the touch of a button. On Bi-Fuel models the temperature gauge in the instrument cluster was replaced by a level gauge for the gas tank. Several options, such as a trip computer and sports suspension, were not available for Bi-Fuel models. Neither Bi-Fuel nor TDI were offered on the North American market. Specialised vehicles, such as taxi and police versions, were also available directly from the factory. Changes included preparations to install additional equipment, a certified calibrated speedometer, uprated brakes with wear indicators and a different level of standard equipment. The V70 XC, also referred to as the V70 Cross Country, the V70 AWD Cross Country, or the V70 Cross Country AWD was introduced in September 1997 at the Frankfurt Auto Show for the 1998 model year as a crossover version of the V70. It featured standard all-wheel drive and was available with only two engine and gearbox choices. In the US only the 2.4L turbo engine together with an automatic gearbox was available. A 2.0L version of the V70 XC was available only for markets with high taxes on cars with an engine capacity of more than 2000 cc. Standard ride height was increased 35 mm (1.4 in) overall with 26 mm (1.0 in) more ground clearance compared to the regular AWD model. Total ground clearance is 166 mm (6.5 in). Visual differences from a standard V70 AWD included a unique front and rear bumper, unpainted sidetrim and sills, a squarer version of the roof rails, a unique front grille and a black decal with white Cross Country lettering across the tailgate. Buyers could also specify a two-tone exterior paint option called Duo Tone. [i] Interior details included thicker floor mats and special canvas/leather upholstery. As the replacement for the popular 850 T-5R and 850 R, the V70 R was unveiled in May 1997. Similar to the previous generation R models it featured a unique leather/Alcantara interior with diamond stitching on the seats. Further styling touches were a special front bumper, blue gauge faces for the instrument cluster, two special colours and special alloy wheels. All US cars were equipped with 16 inch alloy wheels, other markets had 17 inch wheels available at extra cost or as standard equipment. Standard equipment was substantially upgraded over normal models with a few options available such as a trunk mounted CD-changer, Volvo's self developed Road and Traffic Information (RTI) navigation system, or an upgraded stereo system. Intended to be the high-performance version of the model range, all R models were fitted with the highest performance engines of the line up, and were available in both front-wheel and all-wheel drive with either an automatic or manual transmission. A redesigned suspension with lower ride height and firmer shocks was standard. Three different versions were produced, depending on the model year. Engines for the first generation all had five cylinders. The petrol versions were part of the Volvo Modular Engine family, the diesel engines were purchased from VAG. A driver airbag was standard on all V70 models, depending on the market a front passenger airbag was either always included or a no-cost option. Buyers could choose to not have a passenger airbag to be able to install a forward facing child seat. Seatbelt pretensioners, with load limiters, for both driver and front passenger were always part of the standard equipment. Side Impact Protection System (SIPS) was standard on all V70 models. Standard side airbags incorporated into the front seats supplemented the system. Euro NCAP evaluated the S70 (saloon variant of V70) in 1998 awarding it four out of four stars for adult occupant protection. The S70 scored seven of 16 points in the front test, and 16 of 16 in the side test. The car received two of two points available in the pole test. The S70 received a total of 25 of 37 points and therefore four stars (25–32) in Euro NCAP's evaluation. The S70 scored five out of five stars for front impact protection for driver and front passenger in the U.S. National Highway Traffic Safety Administration (NHTSA) safety testing, and four out of five stars for driver and rear passenger side impact protection. The Insurance Institute for Highway Safety (IIHS) granted the 850/S70 their highest rating of "good" for front crash protection. Rear crash protection was rated as "good". The 1999 model year and later vehicles minimized or prevented whiplash with an energy absorbing seatback hinge mechanism that is standard equipment. Volvo released the second generation V70 to most markets in early 2000, and for the model year 2001 in North America. Based on the Volvo P2 platform, the second generation shared major mechanical and styling commonality with the Volvo S60 saloon, offered frontal area of 2.23 m2 (2.67 sq yd) and a coefficient of drag of .30. The new generation featured adhesively bonded construction as opposed to spot welding in key areas, with Volvo claiming the new body to be 70 per cent more rigid than its predecessor. Critical aspects of the design for the second generation were completed before Ford acquired Volvo in 1999. With a 4 cm (1.6 in) increase in width and height, a 5 cm (2.0 in) longer wheelbase, a slightly shorter overall length than its predecessor, and a slightly increased interior cargo volume, it went on sale in early 2000. The interior featured raised seating in the second row, a hard point on the passenger's side of the center console to provide support for a range of optional accessories — e.g., an optional shopping bag holder. A rear-seat table, waste basket and cargo net were integrated into the rear seat backs. Standard interior features included a coat hook integrated into the side of the front passenger's headrest, glove compartment with pen holder and toll card, configurable center console and rear seating with a two-position backrest — one favoring cargo — the other favoring comfort. All P2 platform Volvos received a minor facelift across all markets for 2005. The front fascia was redesigned, tail and head lamps were changed to clear covers, the center console and dashboard received detail changes. Some minor changes were made to the electrical system and some engines, such diesel engine models received a particle filter. A new 6-speed automatic transmission was introduced, available in both AWD and FWD configurations. Production of the second generation V70 and XC70 ended with the 2007 model year. The second generation V70 was styled by British designer Peter Horbury, who said "the design challenge involved marrying sports car style at the front with the necessary limitations of a wagon back." More specifically, he described the concept as the "front end of a Jaguar E-Type married to the back end of a Ford Transit van." A second generation V70 Bi-Fuel was made available. Liquefied petroleum gas (LPG) storage capacity was increased to a total of 100 litres (26 US gal), split into one 75 litres (20 US gal) tank and two 12.5-litre (3.3 US gal) litre tanks. Unlike previous models the tanks were installed on the underside of the car, keeping all of the trunk space available. Bi-Fuel models were only sold with the 2.4L (140PS) non-turbo engine, and a choice between a 5-speed manual or a 5-speed automatic transmission. At its introduction, the second generation V70 XC received a major upgrade. It featured better ground clearance of 8.2 in (210 mm) thanks to a raised suspension, different bodywork with unpainted bumpers and fender extensions, and AWD as standard. An interior grab handle for the front passenger was installed only on this model. Early V70 XC featured special rear view mirrors, a feature that was discontinued after 2003. Engine and gearbox choices were limited. Only the 2.5L low pressure turbo, or the D5 diesel engine with either a 5-speed manual or 5-speed automatic transmission were available. No diesel version was offered for the North American market. For 2003 the model was renamed the XC70, in keeping with Volvo's newly introduced XC90. In 2001, to mark their sponsorship of the just renamed Volvo Ocean Race, special Ocean Race editions of the V70 and V70 XC were announced. Released for model year 2002, the cars came painted only in a unique shade of blue. Silver exterior trim and roof rails, as well as assorted badging, set the models apart from non-OR models. For 2005, Volvo revived the V70 and XC70 Ocean Race Editions. These were unveiled in early 2005, and once again were painted only in a unique shade of blue. They had upgraded standard equipment and special styling touches such as specific alloy wheels, blue interior trim, leather seats with contrast stitching and Ocean Race badges on the outside. As with the previous generation, Volvo offered a high-performance variant called the V70 R AWD. Based on the PCC2 concept car from 2001, the model was unveiled at the 2002 Paris Motor Show on 26 September. Released in 2003, the model pioneered many firsts for Volvo. It was only available with a Haldex based all-wheel drive system and a 2.5L turbocharged five cylinder engine rated at 300 PS (221 kW; 296 hp) and 400 N⋅m (295 lbf⋅ft) of torque. This allowed for a 0–60 mph (0–97 km/h) time of 5.9 seconds. It had an electronically limited top speed of 250 km/h (155 mph). The R was available with a six-speed manual or a five-speed automatic transmission. The 2005 facelift saw the five-speed automatic replaced by a more modern six-speed unit. Large brakes made by Brembo provided high-performance braking capabilities in line with the car's high-performance characteristics. The V70 R came as standard with Volvo's 4C multi-mode suspension developed with suspension experts Öhlins. The driver could choose from three different settings to vary the car's handling depending on driving style and conditions. 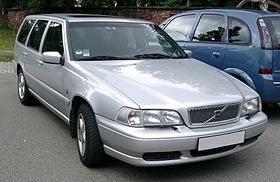 In a 2006 article titled "The Manwagon", The Wall Street Journal linked the V70R to a trend "to lure speed-crazy guys with kids," saying "car makers are trying to transform the dowdy old family hauler into something new," and that "consumer research had unearthed a surprising number of family men who thought wagons could be cool, if only they had more guts." A total of 3407 V70Rs were shipped to North America: 2004–1,565; 2005–823; 2006–674; 2007–345. Engines for the second generation all had five cylinders. The petrol versions were part of the Volvo Modular Engine family. Early model years still used a five-cylinder diesel purchased from VAG which was phased out in favour of Volvo's own five-cylinder diesel from the D5 Engine family. Second V70 generation engine radiators featured an optional "ozone-eating" catalytic coating, marketed as PremAir, which converted ground-level ozone into pure oxygen during normal vehicle operation. The maximum effect was achieved in urban traffic and strong sunlight. Euro NCAP evaluated the S60 (saloon variant of V70) in 2001 awarding it 4 out of 5 stars for adult occupant protection. The S60 scored 10 of 16 points in the front test and 16 of 16 in the side test. The car received two of two points available in the pole test. The S60 received a total of 28 of 37 points and therefore four stars (25–32) in Euro NCAP's evaluation. The Insurance Institute for Highway Safety (IIHS) evaluated the Volvo S60 (saloon variant). The S60 was granted the IIHS's highest rating of "good" in front and rear tests. The S60 was awarded the Institute's second highest rating of "acceptable" in the side test. However, an improvement in the driver dummy's pelvis/leg rating from "marginal" to "acceptable" would yield an overall "good" rating in the side test. On 2 February 2007 Volvo debuted the third generation for model year 2008. Based on the Volvo P3 platform it shared numerous elements as well as general styling with the second generation Volvo S80. Compared with its predecessor, rear-seat legroom was increased by 2 centimetres (0.79 in) and a revised tailgate design increased the load area volume by 55 L. The V70 was offered for the first time with four- and six-cylinder engines. The high-performance V70R AWD models were discontinued with this third generation, only a mostly cosmetic R-Design package was made available. After model year 2011, Volvo discontinued sales of the V70 in North America, instead marketing the FWD variant of the XC70. The Sensus Infotainment System from the Volvo XC60 was made available in 2011 for the V70 and XC70. For 2012 the V70 and XC70 received a minor facelift. The front received a redesigned bumper with chrome accents, the Volvo logo on the front grill was enlarged. The indicators in the side mirrors were redesigned and changed to LED, and the rear light cluster redesigned. New optional alloy wheels and exterior paint options were added. As part of a joint venture with Vattenfall, a Swedish energy company, Volvo converted two Volvo V70 to diesel-electric plug-in hybrid demonstrators that have been in field testing in Göteborg, Sweden, since December 2009. Vattenfall offered customers participating in this trial a supply of renewable electricity generated from wind or hydropower. This test allowed participants to experience the all-electric range at low temperatures, which has been a disadvantage of plug-in vehicles. The V70 PHEV test car uses an 11.3 kWh lithium-ion battery pack. As reported by the test drivers, the V70 Plug-in Hybrid demonstrators have an all-electric range between 20 and 30 kilometres (12 and 19 mi). The demonstrators were built with a button to allow test drivers to manually choose between electricity or diesel engine power at any time. The first phase of the field trial ended in June 2010 and included 16 families, all employees of Volvo or Vattenfall, who had the car for 1.5 weeks to one month. A second phase of the test was to run from July to December 2010 with Vattenfall employees in Göteborg and Stockholm. Most drivers chose to use electricity in city traffic at lower speeds, but switched to diesel for highway driving. Test drivers found that 20 to 30 km was not enough all-electric range, and called for at least 50 kilometres (31 mi), some wanted 80 kilometres (50 mi) and others up to 150 to 200 kilometres (93 to 124 mi). All of the test drivers charge on a daily basis but none ever used the public charging station installed for the trial. Before the test trials, drivers were concerned about being a danger to pedestrians and cyclists due to the quietness of the electric-drive vehicle. After the test several of them changed their opinion and said that this issue was less of a problem than expected. Volvo announced in 2009, and confirmed in 2010, the launch of series production diesel-electric plug-in hybrids as early as 2012. Volvo claimed that its plug-in hybrid could achieve 125 miles per US gallon (1.88 L/100 km; 150 mpg‑imp), based on the European test cycle. Ultimately production of the V70 Plug-in Hybrid did not commence, and the model was never commercially available. As with previous generation models the XC70 features increased ground clearance, optional all-wheel-drive and some cosmetic differences from the normal V70. On the outside there are XC-only front and rear bumpers, side skirts, wheel arch extensions and additional exterior door trims all in unpainted black plastic. The optional roof rails feature an embossed "XC" and are only available in black. Various unique alloy wheels are offered only for the XC. In 2011 Ocean Race Edition versions of the V70 and XC70 were unveiled. All cars featured special interior trim, decor and details. Exterior colours were limited to Ocean Race Blue Metallic or Electric Silver Metallic. Engine choices were limited to the D5 or T6. For 2014. Ocean Race models were updated with detail changes such as different door sill plates, high gloss black mirror caps and front grill. The V70 and XC70 were available with four-, five- and six-cylinder engines. Third generation V70 and XC70 models initially had Volvo's RTI navigation system available and have included Volvo's Sensus Infotainment System console from model year 2012 onward. As usual with Volvo, front seats and rear bench are of orthopedic design. Dolby Pro-Logic systems are standard, and speaker upgrades and sub-woofers are also available. The standard audio system includes a CD player; optional audio has a USB connector for MP3 players, Bluetooth streaming and the ability to import music files to the car's hard disk. From production week 46 in 2013, map upgrades can be performed by the owner via USB, rather than the previous DVD-based system. DVD navigation with map data and remote control is standard on higher specifications. Options include a rear seat DVD entertainment system with two headrest monitors, Xenon headlights with headlamp washers, integrated child booster seats, an integrated home link remote control garage door opener, rear-door child-safety locks, front and rear park assist, power-adjustable front seats with 3-position memory and lumbar support, heated front and rear seats, an integrated grocery bag holder, an integrated sunglass holder, a frameless auto-dimming rear view mirror with rear view mirror compass, a power glass moonroof, 12 volt power outlet in the trunk, leather seats, rear tinted windows, rain sensor and an engine block heater. Anti-submarining seats and overhead-mounted seat belt reminder lights come standard. From model year 2014 onward, a TFT dashboard replaced the analogue instruments. Included as a standard feature beginning in 2007 was the inclusion of Volvo on call roadside assistance for four years, rear window deactivation, safe approach and home safe lighting. As standard, the vehicle is equipped with driver, passenger, side and curtain airbags. Also featured is the WHIPS whiplash prevention system on the front seats. Third generation V70s are available with the BLIS blind-spot sensor system, which can detect a vehicle otherwise hidden from a driver's view because of its position just off to one side of the car. As is typical for Volvos, all models feature daytime running lights to improve driver visibility. Safety options include active-bending xenon headlights, auto dipping main beam, City Safety (which includes pedestrian and cyclist recognition software), Collision Avoidance, adaptive cruise control and traffic following, driver alertness monitoring and lane departure warning. Traffic sign recognition is also available. The latest revision of the XC70 includes DSTC (Dynamic Stability and Traction Control), which is standard on all models and combines the functions otherwise known as Electronic Stability Programme and traction control. Euro NCAP evaluated the V70 in 2007 awarding it 5 out of 5 stars for adult occupant protection. The V70 scored 15 of 16 points in the front test and 16 of 16 in the side test. The car was penalised one point of two points available in the pole test for improper deployment of the curtain airbag in both the original test and the re-test. The V70 was granted an additional two points for seat belt reminders of three available in this category. The V70 received a total of 34 of 37 points and therefore five stars (33–37) in EuroNCAP's evaluation. ^ a b c d e f g "V for Versatility, Vitality - and Value". www.car.volvo.se (Press release). Volvo Car Corporation. 1 September 1997. Archived from the original on 1997-10-17. Retrieved 2017-07-02. ^ Keith Martin (5 November 2000). "BEHIND THE WHEEL - Volvo V70 and Cross Country; A Connecticut Yankee Or a West Coast Dude?". www.nytimes.com. The New York Times. Archived from the original on 2014-01-16. Retrieved 2017-07-16. ^ a b "Volvo's estate cars – a high-capacity trip down memory lane". www.media.volvocars.com. Volvo Car Corporation. 3 July 2003. Archived from the original on 2015-04-02. Retrieved 2017-07-07. ^ "Three milestones on the road to the uncompromising". new.volvocars.com. Volvo Car Corporation. Archived from the original on 2017-09-26. Retrieved 2017-07-07. ^ Henning Sund (14 January 1997). "Volvo S70/V70". www.bilnorge.no (in Norwegian). Archived from the original on 2018-01-27. Retrieved 2017-01-27. ^ a b c Peter Dron (5 February 2000). "Volvo's V70: smaller, bigger and better". www.telegraph.co.uk. The Telegraph. Archived from the original on 2009-11-16. Retrieved 2017-09-29. All crucial work on the new V70 estate was fixed before the Ford takeover, and on its performance much of Volvo's future ability to manage itself without excessive meddling must depend. Sharing the platform of the S80 saloon introduced in 1998, the V70 differs (apart from in obvious respects) only in suspension settings. ^ Robert Petersson; Bernd Stegemann (February 2000). "Trygghetspaketet " [Security package ] (in Swedish). Pictures by Peter Gunnars, Peter Jooss. Auto, Motor & Sport. Archived from the original on 2018-01-27. Retrieved 2018-01-27. ^ "Volvo Cars travels down a familiar road with coming V90 Cross Country". www.media.volvocars.com. Volvo Car Corporation. 8 September 2016. Archived from the original on 2018-01-03. Retrieved 2018-01-03. ^ "Volvo bids farewell to Sweden's favourite car". www.thelocal.se. The Local. 25 April 2016. Archived from the original on 2016-04-26. Retrieved 2017-07-16. ^ "Volvo V70 GEN I / V70XC (1996-2000)". www.media.volvocars.com. Volvo Car Corporation. 27 June 2013. Archived from the original on 2015-02-08. Retrieved 2017-07-07. ^ Hans Dahlquist (14 October 1999). "Volvo i Gent bäst i Europa" [Volvo in Gent best in Europe]. www.nyteknik.se (in Swedish). NY TEKNIK. Archived from the original on 2017-11-26. Retrieved 2017-11-26. ^ "Volvo closes final assembly plant in Halifax, Canada". www.autointell.com. 9 September 1998. Archived from the original on 2016-04-06. Retrieved 2017-10-08. ^ 1997 Volvo V70 first look & designer interview (Television production). Presenter: Mike Rutherford. Men and Motors. 1997. Retrieved 2017-07-12 – via YouTube. ^ CarFile 07/13/1998 (Television production). Presenter: Mike Rutherford. Men and Motors. 13 July 1998. 18:45 minutes in. Retrieved 2017-07-12 – via YouTube. ^ "CVs and Biographies - The inside Story, Barcelona 2005". www.media.volvocars.com. Volvo Car Corporation. 1 August 2005. Archived from the original on 2015-02-09. Retrieved 2017-07-12. ^ a b c d e "SB-10037893-7638" (PDF). static.nhtsa.gov. Volvo Car Corporation. 4 October 2012. p. 4–5. Archived (PDF) from the original on 2018-01-02. Retrieved 2018-01-02 – via NHTSA. ^ "1998 S70 & V70". new.volvocars.com. Volvo Cars of North America. 1997. p. 139. Archived from the original on 2007-10-14. Retrieved 2015-09-21. ^ "1999 S70 & V70". new.volvocars.com. Volvo Cars of North America. 1998. p. 139. Archived from the original on 2010-11-16. Retrieved 2015-09-21. ^ a b Rik Paul (1 December 1997). "A Wagon For The Wild Side". www.motortrend.com. Motor Trend. Archived from the original on 2018-01-08. Retrieved 2018-01-08. ^ "Volvo 850, S70, V70". www.vlvworld.com. Archived from the original on 2015-07-01. Retrieved 2017-07-12. ^ Mikael Stjerna (January 1997). "Pumpad av skönhetsrådet" [Pumped by the beauty queen] (in Swedish). Auto, Motor, Sport. Archived from the original on 2017-11-26. Retrieved 2017-11-26. ^ a b "Volvo Safety". www.volvocars.com. Volvo Cars of North America. 1997. Archived from the original on 1998-02-02. Retrieved 2015-09-26. ^ a b c d "The Volvo S70 and V70 - new cars, new names, new features". new.volvocars.com (Press release). Rockleigh, New Jersey: Volvo Cars of North America. August 1997. Archived from the original on 2017-09-26. Retrieved 2017-07-07. ^ Emission Turbo du 04/01/1997: Volvo berline S70, break V70, Chrysler Viper GTS R [Turbo Issue 04/01/1997: Volvo S70 sedan, V70 estate, Chrysler Viper GTS R]. www.turbo.fr (Motion picture) (in French). 4 January 1997. Archived from the original on 2017-09-26. Retrieved 2017-07-07. ^ "The Volvo S70 and V70: Continuing the Volvo tradition of constant improvement". volvo.custhelp.com (Press release). Rockleigh, New Jersey: Volvo Cars of North America. October 1998. Archived from the original on 2017-12-23. Retrieved 2017-10-25. ^ "Engineering and technological innovation are hallmarks of the 1999 Volvo line-up". new.volvocars.com (Press release). Rockleigh, New Jersey: Volvo Cars of North America. October 1998. Archived from the original on 2007-11-02. Retrieved 2017-07-07. ^ "Second-Generation Sips-Bag protects both chest and head". www.volvogroup.com. Volvo Group AB. 17 July 1998. Archived from the original on 2015-02-21. Retrieved 2017-07-07. ^ a b "The Volvo S70 and V70: Continuing the Volvo tradition of constant improvement". new.volvocars.com (Press release). Rockleigh, New Jersey: Volvo Cars of North America. October 1998. Archived from the original on 2016-09-08. Retrieved 2017-07-07. ^ "2000 Volvo S & V70". new.volvocars.com. Volvo Cars of North America. 1999. p. 137. Archived from the original on 2006-10-22. Retrieved 2017-07-07. ^ "2000 Volvo S & V70". www.new.volvocars.com. Volvo Cars of North America. 1999. p. 137. Archived from the original on 2006-10-22. Retrieved 2017-07-07. ^ "CT" (in Finnish). Archived from the original (JPG) on 2016-03-13. Retrieved 2018-01-01. ^ "1998 V70 - powerful versatility". www.volvocars.com. Volvo Car Corporation. 1998. Archived from the original on 1998-02-02. Retrieved 2017-07-07. ^ "Volvo V70 AWD". www.car.volvo.se. Volvo Car Corporation. 1997. Archived from the original on 1997-10-17. Retrieved 2017-07-07. ^ a b c d "Historic review: Volvo 1990–1999". www.media.volvocars.com. Volvo Car Corporation. 8 January 2000. Archived from the original on 2015-02-10. Retrieved 2015-09-21. ^ "Volvo V70 AWD". www.4wdonline.com. 1998. Archived from the original on 1999-05-06. Retrieved 2017-07-12. ^ "Volvo Range" (PDF). Volvo Car UK Ltd. September 1998. p. 19. Archived (PDF) from the original on 2005-10-29. Retrieved 2017-09-07. ^ Jack Smith (19 May 1999). "From Mother's Ugly Duckling To Chic and Expensive Swan". www.nytimes.com. The New York Times. Archived from the original on 2017-09-17. Retrieved 2017-12-29. ^ "X70 pack'n'load FR/GB/NL/DE" (PDF). accessories.volvocars.com (Accessories brochure) (in French, English, Dutch, and German). Volvo Car Corporation. pp. 78–84. Archived (PDF) from the original on 2015-07-24. Retrieved 2017-07-07. ^ "Volvo S70 and V70 Bi-fuel". www.media.volvocars.com. Volvo Car Corporation. 1 January 1997. Archived from the original on 2017-09-07. Retrieved 2017-07-07. ^ "Volvo V70 BiFuel CNG. New S80 engines". www.volvoclub.org.uk. Volvo Car UK Ltd. Spring 1999. Archived from the original on 2006-09-27. Retrieved 2017-07-07. ^ "Car test - Volvo V70 Bi-Fuel" (PDF). www.theaa.com. The Automobile Association. February 1998. Archived (PDF) from the original on 2017-09-07. Retrieved 2017-07-12. ^ "Nimm Zwei" [Take Two]. www.autobild.de (in German). AutoBild. 12 February 2002. Archived from the original on 2017-09-07. Retrieved 2017-07-07. ^ M. Fermér; G. McInally; G. Sandin (20 September 1999). "Fatigue Life Analysis of Volvo S80 Bi-Fuel" (PDF). mscsoftware.com. Volvo Car Corporation. Archived (PDF) from the original on 2017-09-07. Retrieved 2017-07-07. ^ "GAS FUELLED VEHICLES - GENERAL" (PDF). apvgn.pt. 31 March 2000. pp. 76, 83–84. Archived (PDF) from the original on 2016-05-13. Retrieved 2017-09-07. ^ Volvo AB (1997). "Environmental Report 1997" (PDF). www.volvogroup.com (Company report). pp. 8–12. Archived from the original (PDF) on 2016-08-06. Retrieved 2017-09-07. ^ "Gastank i bil Volvo V70 Bi-Fuel" [Gas tank in Volvo V70 Bi-Fuel]. teknikensvarld.se (in Swedish). 25 April 2014. Archived from the original on 2017-03-05. Retrieved 2017-07-12. ^ Mikael Stjerna (25 April 2014). "Många fina gasbilar riskerar att skrotas" [Many nice gas cars are likely to be scrapped]. www.teknikensvarld.se (in Swedish). Archived from the original on 2014-07-02. Retrieved 2017-09-29. ^ Nils-Olof Nylund, Alex Lawson (31 March 2000). "Exhaust emissions from natural gas vehicles" (PDF). apvgn.pt. IANGV Technical Committee. Archived (PDF) from the original on 2016-05-13. Retrieved 2017-07-12. ^ "Volvo S70/V70 - Dashboard Bi-Fuel". www.media.volvocars.com. Volvo Car Corporation. 5 September 2001. Archived from the original on 2016-03-04. Retrieved 2017-07-07. ^ a b "新車試乗記 ボルボ V70 バイフューエルを試乗レポート！" [Test drive report of the new V70 Bi-Fuel test car!]. www.motordays.com (in Japanese). 19 March 1999. Archived from the original on 2008-05-12. Retrieved 2017-07-07. ^ "Volvo's Bi-Fuel vehicle". www.thecarconnection.com. 18 October 1999. Archived from the original on 2017-07-12. Retrieved 2017-07-07. ^ GTZ GmbH (November 2005). "Sustainable Transport: A Sourcebook for Policy-makers in Developing Cities Module 4d (Natural Gas Vehicles)" (PDF). Bundesministerium für wirtschaftliche Zusammenarbeit und Entwicklung [Federal Ministry for Economic Cooperation and Development]. pp. 5–6. Archived (PDF) from the original on 2018-05-26. Retrieved 2018-02-17. ^ "75 years of Volvo Taxis". www.media.volvocars.com. Volvo Car Corporation. 11 March 2005. Archived from the original on 2018-01-01. Retrieved 2018-01-01. ^ The history of police & getaway cars. Top Gear (1977) (Television production). Presenter: Quentin Willson. 1997. Retrieved 2017-09-24 – via Youtube. ^ "1999 Volvo V70 Hydraulic pump and control unit police (US)" (Parts diagram). www.volvopartswebstore.com. Volvo Car Corporation. Archived from the original on 2018-01-08. Retrieved 2017-07-07. ^ hamish (15 October 2006). "Warning - police spec brake pads!". www.vpcuk.org (Forum post). Archived from the original on 2017-07-12. Retrieved 2017-07-07. ^ "1999 Volvo V70 wheel brake, Police (GB)" (Parts diagram). www.volvopartswebstore.com. Volvo Car Corporation. Archived from the original on 2017-09-08. Retrieved 2017-07-07. ^ a b Peter Passel (8 February 1998). "An Outback Gone Upscale". www.nytimes.com. The New York Times. Archived from the original on 2010-11-09. Retrieved 2017-12-29. ^ "Volvo XC70" (PDF). esd.volvocars.com (in German). Volvo Car Corporation. 2014. p. 4. Archived (PDF) from the original on 2017-12-11. Retrieved 2017-12-11. ^ "Économie - La Presse" (PDF). collections.banq.qc.ca (in French). La Presse. 1 December 1998. p. 5. Archived from the original (PDF) on 2017-10-30. Retrieved 2017-11-25. ^ "Annual report 1997" (PDF). www3.volvo.com. AB Volvo. 1997. pp. 14, 26. Archived from the original (PDF) on 2006-10-31. Retrieved 2017-07-29. ^ "Volvo V70 XC: Stelzen für den Schweden" [Volvo V70 XC: Stilts for the Swede]. www.spiegel.de (in German). 26 June 2000. Archived from the original on 2016-05-18. Retrieved 2017-07-07. ^ НИКОЛАЙ КАЧУРИН (Nikolay Kachurin) (December 1997). "Кросс через испанское кантри" [Crossing through the Spanish countryside]. www.autopilot.ru (in Russian). Archived from the original on 2016-09-20. Retrieved 2017-12-31. ^ André Idzikowski (October 2000). "Volvo V70 Cross Country - A Volvo wagon for the wannabe Marlboro man". www.caranddriver.com. Hearst Communications Inc. Archived from the original on 2012-01-11. Retrieved 2017-07-07. ^ "V70 AWD XC - A clear alternative for SUV buyers". new.volvocars.com. Volvo Cars of North America. August 1999. Archived from the original on 2017-07-29. Retrieved 2017-07-29. ^ a b "V70 XC - a new step forward for Volvo's estate cars". www.car.volvo.se. Volvo Cars of North America. 1 September 1997. Archived from the original on 17 October 1997. Retrieved 2017-07-02. ^ a b "1998 V70". new.volvocars.com. Volvo Cars of North America. 1997. Archived from the original on 2009-11-05. Retrieved 2017-07-29. ^ a b "1999 V70 (specifications)". new.volvocars.com. Volvo Cars of North America. 1998. Archived from the original on 2009-10-14. Retrieved 2017-07-12. ^ a b "2000 V70 (specifications)". new.volvocars.com. Volvo Cars of North America. 1999. Archived from the original on 2008-06-19. Retrieved 2017-07-12. ^ "Volvo V70 XC, 1998, 1999". www.4wdonline.com. 1998. Archived from the original on 2017-07-30. Retrieved 2017-07-29. ^ Erik Wale (August 2000). "Volvo V70 1993-1999" (PDF). www.bilnorge.no (in Norwegian). Archived (PDF) from the original on 2017-07-29. Retrieved 2017-07-29. ^ a b "Volvo's new family of AWD sportswagon: Sure-footedness is added to an already versatile platform". new.volvocars.com. Volvo Cars of North America. August 1997. Archived from the original on 2017-07-29. Retrieved 2017-07-29. ^ a b "Volvo V70 AWD XC". www.volvocars.com. Volvo Cars of North America. 1998. Archived from the original on 1998-06-13. Retrieved 2017-07-29. ^ "Official picture showing Duo Tone paint" (JPG). www.media.volvocars.com. Volvo Car Corporation. 5 March 2003. Archived from the original on 2017-07-29. Retrieved 2015-09-21. ^ "V70" (PDF). www.volvocars.com (Sales Brochure). Rockleigh, New Jersey: Volvo Cars of North America | Volvo Canada Ltd. 1997. pp. 11, 34. Archived from the original (PDF) on 1998-06-13. Retrieved 2018-09-14. ^ Warren Brown (14 November 1997). "1998 Volvo V70 XC Review". www.cars.com. Washington Post. Archived from the original on 2017-09-22. Retrieved 2017-09-22. ^ a b "Volvo V70 AWD R". www.volvocars.com. Volvo Cars of North America. 1998. Archived from the original on 1998-06-13. Retrieved 2017-07-12. ^ "Volvo S70 and V70". new.volvocars.com (Press release). Rockleigh, New Jersey: Volvo Cars of North America. August 1997. Archived from the original on 2017-07-12. Retrieved 2017-07-12. ^ "Volvo Audio - Features - CD changer". www.car.volvo.se. Volvo Cars of North America. 1997. Archived from the original on 1998-02-06. Retrieved 2017-07-07. ^ "RTI - Electronic route-finding for greater safety and a better environment". www.car.volvo.se. Volvo Cars of North America. 1 September 1997. Archived from the original on 1997-10-17. Retrieved 2017-07-07. ^ "Volvo V70". www.car.volvo.se. Volvo Car Corporation. 1997. Archived from the original on 1998-02-06. Retrieved 2017-07-02. ^ Warren Brown (20 February 1998). "1998 Volvo V70 - review". www.cars.com. Archived from the original on 2017-07-12. Retrieved 2017-07-07. ^ Victor M. Fernandez (1998). "Volvo S70 / V70 R - rápidos" [Volvo S70 / V70 R - fast] (in Spanish). Motor16. Archived from the original on 2017-12-23. Retrieved 2017-12-23. ^ Oskar Kurtti (2015). Management of coloured parts and colour combinations in PDM systems (PDF). publications.lib.chalmers.se (Master). Gothenburg, Sweden: Chalmers University of Technology. Archived (PDF) from the original on 2017-04-10. Retrieved 2017-07-07. ^ "Touch-up paint - 441 Laser blue met (P/N#31395203)". www.skandix.de. Archived from the original on 2017-09-29. Retrieved 2017-07-07. 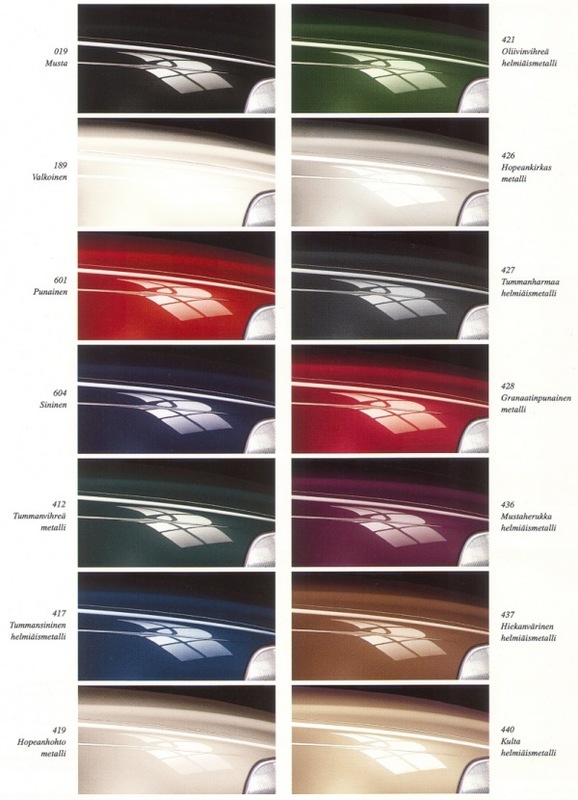 ^ "Volvo Broschyrer S/V70 1997-2000" [Volvo brochure S/V70 1997-2000] (PDF). 360.haubits.net (in Norwegian). Volvo Car Corporation. 2000. Archived (PDF) from the original on 2017-07-12. Retrieved 2017-07-12. ^ "Nuevos traccíon total de Volvo - Volvo V70 R AWD y S70 AWD" [New total traction by Volvo - V70 R AWD and S70 AWD] (in Spanish). Autopista. Archived from the original on 2017-12-23. Retrieved 2017-12-23. ^ a b c "The V70 revolution continues". new.volvocars.com (Press release). Rockleigh, New Jersey: Volvo Cars of North America. August 1999. Archived from the original on 2017-07-12. Retrieved 2017-07-12. ^ Fmfosnacht (1 June 2017). 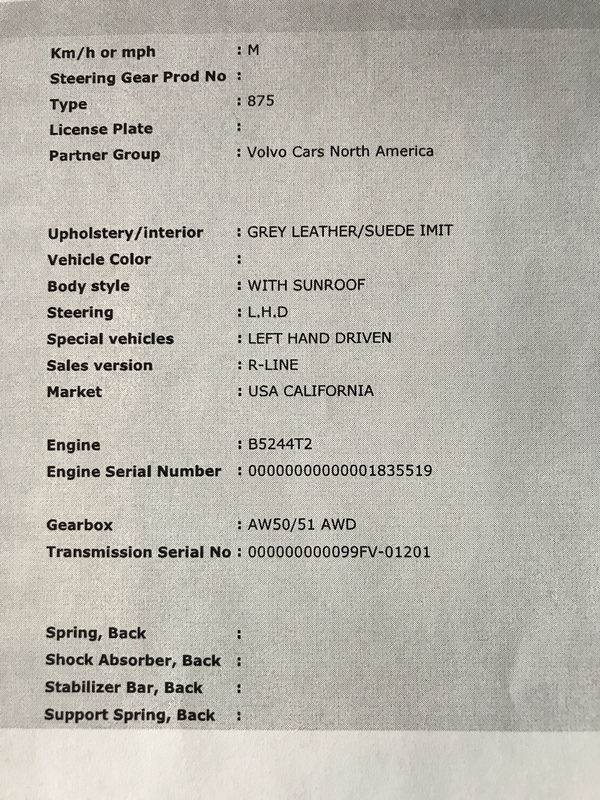 "VIDA printout for MY2000 V70 R AWD" (JPG). forums.swedespeed.com. Archived from the original on 2017-07-03. Retrieved 2017-07-03. ^ Bente Bjørnsen (29 May 1999). "Fornyet Volvo V70 R AWD: Stor, sterk og sporty" [Renewed Volvo V70 R AWD: Big, strong and sporty]. www.dinside.no (in Norwegian). Archived from the original on 2017-07-12. Retrieved 2017-07-12. ^ a b Joakim Andersson (2 September 1999). "Provkörning av Volvo V70 R AWD" [Test drive of the V70 R AWD]. teknikensvarld.se (in Swedish). Teknikens Värld. Archived from the original on 2017-07-29. Retrieved 2017-07-12. ^ Ekendahl-Lasse; Ericsson-Calle (25 September 1999). "Test Volvo V70R AWD: Volvo sparar inte på krutet i senaste lyxåket. Prestanda i toppklass, men bränsletörst och stötig gång drar ned betyget" [Test Volvo V70R AWD: Volvo does not hold back with their latest luxury ride. Top class performance but fuel thirsty and rough ride pull down the grade]. www.dn.se (in Swedish). Dagens Nyheter. Archived from the original on 2017-07-12. Retrieved 2017-07-12. ^ a b c "1999 S70 & V70 owner's manual". new.volvocars.com. Volvo Car Corporation. 1998. p. 135. Archived from the original on 2017-02-09. Retrieved 2015-09-21. ^ a b c d e "2000 Volvo S & V70 owner's manual". new.volvocars.com. Volvo Car Corporation. 1999. p. 135. Archived from the original on 2017-02-02. Retrieved 2015-09-21. ^ a b Volvo Car Corporation (1997). "Volvo S70 opuscolo" [Volvo S70 brochure] (PDF). myvolvolibrary.info (in Italian). Volvo Car Italia SPA. pp. 40–41. Archived (PDF) from the original on 2017-12-23. Retrieved 2017-12-23. ^ Mattias Persson (July 1997). "R som i Rolig" [R as in Funny]. egmont-media.s3-website-eu-west-1.amazonaws.com (in Swedish). Archived from the original on 2017-07-29. Retrieved 2017-07-29. ^ a b "1997 V70 brochure" (PDF). www.volvoclub.org.uk. Volvo Car UK Ltd. 1997. pp. 36–37. Archived (PDF) from the original on 2003-07-26. Retrieved 2017-09-28. ^ "Car Test: Volvo S80 2.5D" (PDF). www.theaa.com. The Automobile Association. January 2000. p. 1. Archived (PDF) from the original on 2010-03-31. Retrieved 2017-09-28. ^ "BI-FUEL". www.coloribus.com (print advertisement). Forsman & Bodenfors. November 1998. Archived from the original (JPG) on 2017-03-05. Retrieved 2017-12-30. ^ Kim Stewart, ed. (29 November 1997). "STATUS REPORT - Special Issue: airbags" (PDF). www.iihs.org. Vol. 32 no. 9. Insurance Institute for Highway Safety. p. 8. Archived (PDF) from the original on 2019-02-08. Retrieved 2018-05-13. ^ "Status Report" (PDF). IIHS. 29 November 1997. p. 8. Retrieved 2018-04-17. ^ "Volvo S70 and V70 series" (PDF). www.volvoclub.org.uk. Volvo Car Corporation. August 1997. p. 1. Archived (PDF) from the original on 2017-09-30. Retrieved 2017-07-21. ^ "S70 EuroNCAP evaluation". www.euroncap.com. EURO NCAP. 1998. Archived from the original on 2010-02-10. Retrieved 2017-07-21. ^ "Volvo S70 - Side star rating - 4 of 5 stars". www.media.volvocars.com. Volvo Car Corporation. 1 January 1998. Archived from the original on 2017-09-29. Retrieved 2017-07-12. ^ "850/S70 IIHS evaluation". www.iihs.org. IIHS. Archived from the original on 2008-11-28. Retrieved 2017-10-29. ^ "Volvo's WHIPS Proven to Reduce Head and Neck Injury by 49 Percent". www.theautochannel.com. 24 October 2002. Archived from the original on 2017-10-06. Retrieved 2017-10-29. ^ a b c "Volvo V70 Cross Country prijslijst MY01" [Price list Volvo V70 Cross Country MY01] (PDF). volvo-tools-prd-media.s3.amazonaws.com (in Dutch). Volvo Car BV Netherlands. 22 January 2001. pp. 2, 9. Archived (PDF) from the original on 2019-02-08. Retrieved 2018-06-26. ^ Alrik Söderlind (August 2004). "Storsäljare i skamvrån" [Top seller in disgrace]. egmont-media.s3-website-eu-west-1.amazonaws.com (in Swedish). Pictures by Peter Gunnars. Auto, Motor & Sport. Archived from the original on 2018-01-08. Retrieved 2018-01-08. ^ Gunnar Dackevall (January 2003). "Rykande nyheter" [Smoking news]. egmont-media.s3-website-eu-west-1.amazonaws.com (in Swedish). Pictures by Lennart Petersson. Auto, Motor & Sport. Archived from the original on 2018-01-08. Retrieved 2018-01-08. ^ "Volvo. Volvo In Thailand". www.car-cat.com. Archived from the original on 2012-04-04. Retrieved 2010-07-16. ^ "The Volvo V70 is still his baby". www.media.volvocars.com. Volvo Car Corporation. 26 November 2003. Archived from the original on 2018-01-11. Retrieved 2018-01-11. ^ a b "Virutal car design: From 'stone age' to 21st century in eight years". www.media.volvocars.com. Volvo Car Corporation. 22 January 2003. Archived from the original on 2018-01-11. Retrieved 2018-01-02. ^ "2001 Volvo V70 owner's manual". new.volvocars.com. Volvo Car Corporation. 2000. p. 137. Archived from the original on 2017-03-26. Retrieved 2015-09-21. 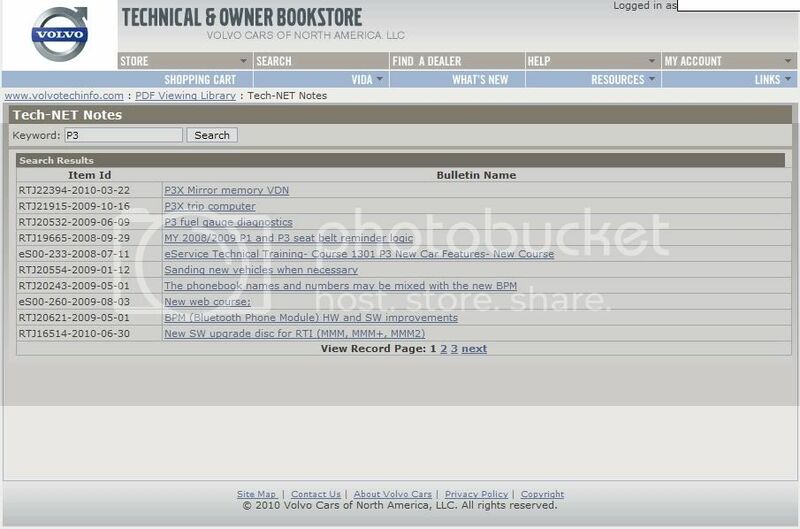 ^ "2007 Volvo V70 owner's manual". new.volvocars.com. Volvo Car Corporation. 2006. p. 214. Archived from the original on 2017-08-27. Retrieved 2015-09-21. ^ "2004 Volvo V70 owner's manual". new.volvocars.com. Volvo Car Corporation. 2003. p. 145. Archived from the original on 2017-09-29. Retrieved 2015-09-21. ^ Johan Westerberg (June 2000). "Folkhemsherrgård!". egmont-media.s3-website-eu-west-1.amazonaws.com (in Swedish). Picture by Lennart Pettersson. Auto, Motor & Sport. Archived from the original on 2018-01-08. Retrieved 2018-01-08. ^ "Volvo V70" (PDF). www.volvoclub.org.uk. Volvo Car UK Ltd. 2003. Archived (PDF) from the original on 2017-09-29. Retrieved 2017-11-07. ^ a b Frank Bohanan (14 May 2001). "PremAir: Kills Ozone Dead?". www.thecarconnection.com. Archived from the original on 2017-08-06. Retrieved 2017-08-05. ^ a b "Model Year 2006 Design" (PDF). Volvo Car Corporation. 2005. Archived (PDF) from the original on 2007-01-14. Retrieved 2017-09-29. Peter Horbury, who was Volvo's Design Director from 1991 to 2003, gives an enigmatic response when questioned about the concept for the Volvo V70: "Imagine the front end of an E-type Jaguar married to the back end of a Ford Transit van," he says. "With the Volvo V70, we have tried to combine the two." Thankfully, the end product is rather more handsome than Horbury's image suggests. The Volvo V70 offers a brilliant synthesis of the latest Volvo dynamic design cues, while retaining the practicality and versatility expected of a proper Volvo estate. It's also a shape that's exceptionally efficient – the CD figure is just 0.30 – and this helps both high-speed stability and fuel consumption. ^ a b c d "First Drive, Volvo V70" (PDF). www.theaa.com. The AA. February 2000. Archived (PDF) from the original on 2006-06-28. Retrieved 2017-07-07. ^ a b c "The Volvo V70 – Beautiful, Versatile, Typically Scandinavian". www.autoweb.com. Web Publications Pty Limited. 11 January 2000. Archived from the original on 2011-11-22. Retrieved 2017-09-29. The side windows have a single, simple line running along the top from front to rear. This shows that the Volvo V70 was designed to be a wagon and is not an adapted saloon shape. As on every Volvo wagon, the third side window is longer than the others, to show it is a true load carrier. Horbury says the design challenge involved marrying sports car style at the front with the necessary limitations of a wagon back. "The element that ties the two distinctly different halves together is the full-length shoulders, inherited from the Volvo S80 but also reminiscent of the mother of all wagons, the Volvo 145/245, which shared the identical feature. ^ "Volvo V70 Marketing Positioning" (PDF). www.volvoclub.org.uk. Volvo Car Corporation. Archived (PDF) from the original on 2006-05-18. Retrieved 2017-07-07. ^ Peter Tomicic (5 October 2011). "64th Frankfurt International Motor Show 2011 Interview with Peter Horbury, Volvo". cardesigncommunity.com. Archived from the original on 2011-11-07. Retrieved 2017-11-07. ^ "Volvo Bi-Fuel Road Tests". www.volvoclub.org.uk. Volvo Owners Club Ltd. Archived from the original on 2017-09-29. Retrieved 2017-11-07. ^ Michael Harnischfeger (18 July 2012). "Fahrbericht Volvo S80 Bi-Fuel – Volvo gibt Gas" [Drive review: Volvo S80 Bi-Fuel – Volvo hits the gas]. www.sueddeutsche.de (in German). Süddeutsche Zeitung. Archived from the original on 2014-04-29. Retrieved 2017-11-07. ^ a b 2003 Volvo V70 XC – Off-Road Test Drive & Review. www.youtube.com (Television production). Presenter: Glenda McKay. Men and Motors. 24 June 2014. Retrieved 2015-09-21 – via YouTube. ^ "Volvo V70 im Test: Staub-Berater" [Volvo V70 review: Dust consultant]. www.auto-motor-und-sport.de (in German). Auto, Motor & Sport. 12 July 2000. Archived from the original on 2015-12-08. Retrieved 2018-01-07. ^ "Volvo Ocean Race: Die "Illbruck" schreibt Geschichte" [Volvo Ocean Race: The 'Illbruck' makes history]. www.spiegel.de (in German). 10 June 2002. Archived from the original on 2016-08-20. Retrieved 2017-07-13. ^ xeltecc (17 July 2011). "2002er Volvo V70 XC Ocean Race". www.bmw-drivers.de (in German). Archived from the original on 2017-09-30. Retrieved 2017-07-13. ^ Cinesnow (1 February 2006). "2002 V70 XC "Ocean Race" Edition #176". forums.swedespeed.com. Archived from the original on 2016-08-18. Retrieved 2017-07-13. ^ "Volvo V70 / V70 XC Ocean Race Edition" [Volvo V70 / V70 XC Ocean Race Edition] (PDF). volvo-tools-prd-media.s3.amazonaws.com (price list) (in Dutch). Volvo Car BV Netherlands. 30 July 2001. pp. 1–2. Archived (PDF) from the original on 2018-06-26. Retrieved 2018-06-26. ^ "Volvo Introduces Special Volvo Ocean Race Edition – Three Models with Unique Ocean Blue Livery". www.swedespeed.com. Volvo Car Corporation. 13 February 2005. Archived from the original on 2017-08-06. Retrieved 2015-09-21. ^ a b George Achorn (9 August 2006). "Driven: 2006 XC70 Ocean Race Edition (European Spec)". www.swedespeed.com. Archived from the original on 2017-08-06. Retrieved 2015-09-21. ^ "The design of the Volvo S60 R and Volvo V70 R: Exclusive sportiness and optimisation". www.media.volvocars.com. Volvo Car Corporation. 26 September 2002. Archived from the original on 2017-09-29. Retrieved 2017-07-23. ^ "Volvo wagon image: Thor strikes again". www.media.volvocars.com. Volvo Car Corporation. 4 January 2002. Archived from the original on 2016-08-20. Retrieved 2017-07-23. ^ "Volvo S60 R and Volvo V70 R at Paris Motor Show". www.media.volvocars.com. Volvo Car Corporation. 25 September 2002. Archived from the original on 2016-08-20. Retrieved 2017-07-23. ^ a b "R model press kit" (PDF). www.volvoclub.org.uk. Volvo Car Corporation. 3 April 2003. Archived (PDF) from the original on 2016-03-05. Retrieved 2017-07-23. ^ "Volvo S60R and Volvo V70R Model Year 2005 Specifications". www.volvoclub.org.uk. Volvo Car Corporation. 2004. Archived from the original on 2012-04-07. Retrieved 2017-07-23. ^ Alex L. Dykes (11 April 2007). "Volvo V70R AWD Review". www.thetruthaboutcars.com. Archived from the original on 2015-05-17. Retrieved 2017-07-23. ^ "The new Volvo R - Demand More" (PDF). www.volvoclub.org.uk. Volvo Car UK Ltd. October 2002. Archived (PDF) from the original on 2017-09-29. Retrieved 2017-11-05. ^ a b Jonathan Welsh (24 February 2006). "The Manwagon". online.wsj.com. The Wall Street Journal. Archived from the original on 2007-06-01. Retrieved 2017-07-16. Seeking to lure speed-crazy guys with kids, car makers are trying to transform the dowdy old family hauler into something new: the manwagon. In perhaps the most extreme sign of the industry's horsepower race, some of these wagons are quicker than a Porsche Boxster. They have monstrous engines, giant brakes, track-ready suspensions and race-car-style seats – plus prices up to $30,000 higher than the base versions. But unlike a sports car, these wagons can fit strollers and coolers in the back. This melding of speed and sippy cups may seem unlikely, but car makers say their consumer research has unearthed a surprising number of family men who thought wagons could be cool, if only they had more guts. ^ "V70R production numbers by model year". forums.swedespeed.com. 1 April 2010. Archived from the original on 2016-04-07. Retrieved 2017-07-16. ^ a b c d e f g h i j "Volvo V70 Betriebsanleitung MY04" [Volvo V70 owner's manual MY04] (PDF). az685612.vo.msecnd.net (in German). Volvo Car Corporation. 2003. pp. 147–148. Archived (PDF) from the original on 2017-08-06. Retrieved 2017-09-28. ^ a b c "V70 Betriebsanleitung MY06" [Volvo V70 owner's manual MY06] (PDF). az685612.vo.msecnd.net (in German). Volvo Car Corporation. 2005. pp. 232–240. Archived (PDF) from the original on 2017-09-29. Retrieved 2017-09-28. ^ "Volvo V70 Preisliste 2002" [2002 Volvo V70 price list] (PDF). www.motor-talk.de (in German). Volvo Cars Germany. 8 July 2002. pp. 12–13. Archived from the original on 2017-08-06. Retrieved 2017-08-05. ^ "Volvo Bi-Fuel" (PDF). www.volvoclub.org.uk (Brochure). Volvo Car Corporation. May 2003. pp. 10–11. Archived (PDF) from the original on 2017-09-29. Retrieved 2017-09-28. ^ "Volvo S60 / 2nd generation V70 EuroNCAP evaluation". www.euroncap.com. EuroNCAP. 2001. Archived from the original on 2013-05-31. Retrieved 2018-01-07. ^ "IIHS-HLDI: Volvo S60 (2001-2009)". www.iihs.org. IIHS. Archived from the original on 2012-01-18. Retrieved 2018-01-01. ^ Bo Lundvang (25 April 2016). "Här rullar sista V70:n av i Torslanda" [Here the last V70 leaves Torslanda]. www.bilsport.se (in Swedish). Archived from the original on 2016-04-29. Retrieved 2017-07-13. ^ Knut Skogstad (26 April 2016). "Volvo V70: Her forlater det siste eksemplaret fabrikken" [Volvo V70: Here the last example leaves the factory]. www.tv2.no (in Norwegian). Archived from the original on 2016-05-03. Retrieved 2017-07-13. ^ "Volvo V70 - model year 2016". www.media.volvocars.com. Volvo Car Corporation. 28 April 2015. Archived from the original on 2015-09-15. Retrieved 2017-07-13. ^ a b "Refined Scandinavian design gives the all-new Volvo V70 even more star quality". www.media.volvocars.com. Volvo Car Corporation. 2 February 2007. Archived from the original on 2017-12-29. Retrieved 2017-12-29. ^ agarberg. "P3 designation being used in official Volvo literature" (JPG). i548.photobucket.com. Archived from the original on 2018-01-03. Retrieved 2018-01-03. ^ "Models – 2014 V70 – Overview". www.media.volvocars.com. Volvo Car Corporation. 13 May 2013. Archived from the original on 2013-10-23. Retrieved 2017-07-16. ^ "Models – 2013 XC70 – technical data". www.media.volvocars.com. Volvo Car Corporation. 29 August 2012. Archived from the original on 2013-10-24. Retrieved 2017-07-16. ^ Stephan Bähnisch (8 May 2008). "Volvo V70 R-Design: Kombi reloaded" [Volvo V70 R-Design: Station wagon reloaded]. www.autobild.de (in German). Auto Bild. Archived from the original on 2014-04-18. Retrieved 2018-08-21. ^ "Volvo Cars of North America, LLC, announces pricing of its 2011 model lineup". www.media.volvocars.com (Press release). Rockleigh, New Jersey: Volvo Cars of North America. 21 June 2010. Archived from the original on 2011-07-17. Retrieved 2012-01-06. ^ "New technology, more power and improved fuel efficiency feature in upgraded Volvo V70, XC70 and S80 models". www.media.volvocars.com (Press release). Volvo Car UK Ltd. 12 April 2011. Archived from the original on 2017-08-10. Retrieved 2015-09-21. ^ "Volvo V70 - model year 2012". www.media.volvocars.com. Volvo Car Corporation. 20 May 2011. Archived from the original on 2015-04-02. Retrieved 2017-08-10. ^ "Volvo V70 Plug-in Diesel-Electric Hybrid". www.dailymotion.com. Volvo Car Corporation. 13 June 2015. Retrieved 2017-07-16 – via Dailymotion. ^ Sara-Linnéa Österval (March 2011). "Driving a plug-in Hybrid" (PDF). www.vattenfall.com. Vattenfall AB. Archived from the original (PDF) on 2012-10-21. Retrieved 2017-07-16. ^ a b c d "Having a plug-in hybrid as your family car -what is it actually like?" (PDF). www.plugincars.com. Vattenfall AB. September 2010. pp. 3–4. Archived (PDF) from the original on 2012-10-10. Retrieved 2010-09-05. ^ a b "Volvo Cars and Vattenfall to Develop New Plug-in Diesel-Electric Hybrids; Three V70 PHEV Demonstrators on the Road This Summer". www.greencarcongress.com. Green Car Congress. 1 June 2009. Archived from the original on 2017-10-20. Retrieved 2009-06-04. ^ Brad Berman (9 March 2010). "Volvo V70 Plug-in Hybrid". www.plugincars.com. Archived from the original on 2010-05-22. Retrieved 2010-10-05. ^ a b c Brad Berman (1 October 2010). "Volvo reports reactions from first drivers of Volvo V70 Plug-in Hybrid". www.plugincars.com. Archived from the original on 2010-11-21. Retrieved 2010-10-05. ^ Richard Bremner (23 September 2009). "Volvo V70 Plug-in Hybrid review". www.autocar.co.uk. Archived from the original on 2015-06-07. Retrieved 2017-09-29. ^ John Voelcker (2 June 2009). "Volvo to introduce plug-in diesel by 2012". www.foxnews.com. Fox News. Archived from the original on 2009-06-05. Retrieved 2009-06-04. ^ "Car Reviews: Volvo XC70 SE Lux D5". www.theaa.com. The Automobile Association. July 2007. Archived from the original on 2017-08-10. Retrieved 2017-09-29. ^ "Geneva 2011: Volvo Debuts Ocean Race Edition Cars". swedespeed.com. 1 March 2011. Archived from the original on 2017-08-10. Retrieved 2015-09-21. ^ "Volvo V70 Preisliste MY13" [Volvo V70 price list MY13] (PDF) (Brochure) (in German). Volvo Car Austria. 1 May 2012. p. 8. Archived from the original (PDF) on 2018-01-09. Retrieved 2018-01-09. ^ "Exclusive Volvo Ocean Race Edition and V70 & XC70 Edition released in Geneva". www.swedespeed.com. Volvo Car Corporation. 19 February 2014. Archived from the original on 2017-08-10. Retrieved 2017-08-10. ^ "Exclusive Volvo Ocean Race Edition and V70 & XC70 Edition released in Geneva". www.media.volvocars.com. Volvo Car Corporation. 18 February 2014. Archived from the original on 2017-09-29. Retrieved 2017-07-16. ^ a b c d e f g h "Volvo V70 & XC70 owner's manual MY09" (PDF). az685612.vo.msecnd.net. Volvo Car Corporation. 2008. p. 280. Archived (PDF) from the original on 2017-08-10. Retrieved 2017-08-10. ^ "V70 Broschyr MY11" [V70 brochure MY11] (PDF). www.mrzaz.com (in Swedish). Volvo Car Corporation. April 2010. Archived from the original (PDF) on 2017-04-14. Retrieved 2017-07-16. ^ a b c d "Volvo V70 & XC70 owners manual MY11" (PDF). az685612.vo.msecnd.net. Volvo Car Corporation. 2010. p. 298. Archived (PDF) from the original on 2017-08-11. Retrieved 2017-08-10. ^ a b c d e f g h i j k l m n o "Volvo V70 & XC70 owners manual MY12" (PDF). az685612.vo.msecnd.net. Volvo Car Corporation. 2009. p. 372. Archived (PDF) from the original on 2017-08-10. Retrieved 2017-08-10. ^ a b "2008 Volvo V70". new.volvocars.com. Volvo Cars of North America. 2007. p. 272. Archived from the original on 2017-08-10. Retrieved 2017-08-10. ^ "Volvo V70 Preisliste" [Volvo V70 price list] (PDF) (Brochure) (in German). Volvo Cars Germany GmbH. 10 October 2010. pp. 3–4, 26–27. Archived from the original on 2018-02-21. Retrieved 2018-02-20. ^ a b c "Volvo V70 & XC70 owners manual MY10" (PDF). az685612.vo.msecnd.net. Volvo Car Corporation. 2011. p. 286. Archived (PDF) from the original on 2017-08-10. Retrieved 2017-08-10. ^ "Volvo V70 & XC70 Betriebsanleitung MY14" [Volvo V70 & XC70 owner's manual MY14] (PDF). az685612.vo.msecnd.net (in German). Volvo Car Corporation. 2013. pp. 403–405. Retrieved 2019-02-01. ^ "Models - 2014 V70 - technical data". www.media.volvocars.com. Volvo Car Corporation. 13 May 2013. Archived from the original on 2013-10-23. Retrieved 2017-07-03. ^ "3rd generation V70 Euro NCAP evaluation". www.euroncap.com. EuroNcap. 2009. Archived from the original on 2010-02-10. Retrieved 2017-10-29. 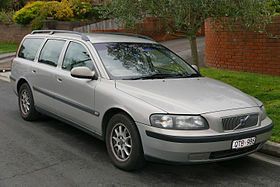 Wikimedia Commons has media related to Volvo V70. Wikimedia Commons has media related to Volvo XC70.